I recently received my t-scores from a bone density test. My spine is fine -1.7 but my femur score is -2.7. The doctor has recommended Prolia but I am hesitant to put that in my body. I already exercise, don’t smoke and consume little to no caffeine. Any suggestions on ways to improve that score through Yoga? What movements can I do? What movements should I avoid? What movements will make my condition worse? What movements will make my condition better? Once you have this information, you will be in a better position to look after yourself in any yoga class. Since you mentioned you are trying to improve your score for your bone density in your femur (the top of your leg bone), I would recommend standing yoga postures. These weight bearing postures that encourage the full range of motion of your joints will encourage bone density. Yoga is wonderful for bone health on many levels. For one, it helps improve balance and coordination, both important in preventing falls. In yoga you learn to hold poses for long periods and shift your body weight to one side or the other. Both of these practices offer an extra load that creates more tension from tendons pulling on bone. The more tension, the more new bone your body will make. Yoga also has lots of stretching, which we now understand also stimulates new bone growth. Dr. Loren Fishman has proven in his pilot studies that just 10 minutes of yoga a day can improve bone density. (Show Goddess Victory Squat, lift heels for balance, one than other for modified). 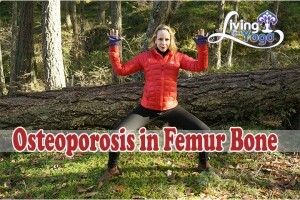 How can yoga help rebuild bone mass? At the beginning I gave Margaret a list of questions she could take to her doctor. If you would like a handy list of these questions that you can print out and take to your doctor, enter your email address below and I’ll send it to you .